Anyone who has ever visited the Muros e Noia estuary will forever remember the silhouette of Mount Louro, because it is unmistakable. Its two humps seem to emerge from the ocean itself to close on the north side the mouth of the Tambre. This is one of the many magical mountains that Galicia has, with the peculiarity of its location, right on the seafront. Mount Louro has a significant elevation, since its highest point is at 241 meters of altitude. This height becomes even more pronounced considering what surrounds it: to the east, west and south, it is surrounded by the waters of the Atlantic, while to the north it joins the mainland through a strip of sand and a plain presided over by the lagoon of its same name. The strip of sand is the beach of Area Maior, one of the largest beaches in an area with abundant spectacular places. 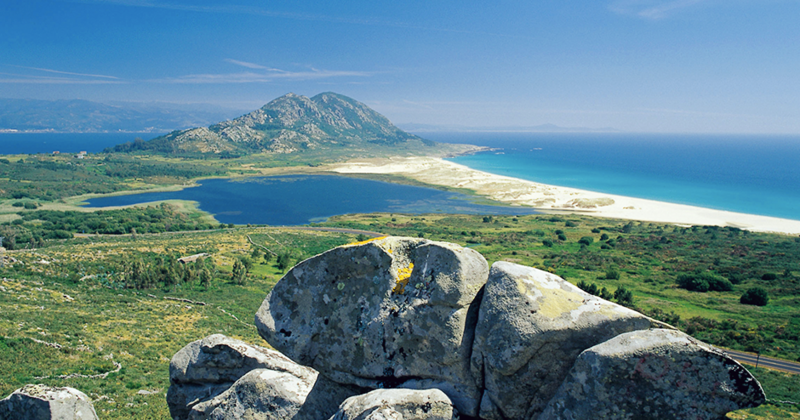 It has a length of about a kilometre and a half and its high dunes block the access to the sea of ​​the lagoon of As Xalfas or Louro, formed where the waters of the river Longarela lie still. This humid area, which grows in size in the rainy season and reaches a depth of only two meters, was classified as a Site of Community Importance and is home to a large number of bird species. Lovers of ornithological observation will spend a fabulous day walking around in this environment and spotting species such as the mallard, the coot, the rails , the duck or even the heron. Its botanical wealth is also noteworthy, since in the area species adapted to dry weather have taken root, such as the Lilaeopsis Caroliana, which find here its only home in Galicia. As it happens with almost every lagoon worth its salt, Louro also has its own legend: it is said that under its waters lies a buried city and on stormy days one can hear the church bells ring and even the inhabitants’ voices . The top of the mountain can be accessed through a narrow road. During the Middle Ages, in its highest point there was a watchtower or small castle, of which today only a few rocks can be found. Over the cliff the lighthouse, built in 1862, is located. From it you can get a beautiful view of the southern coast of the estuary of Muros and Noia, with the white beaches of Porto do Son presiding over the image. While descending from the peak you can visit the surrounding beaches (Ancoradoiro, Lariño, San Francisco and the aforementioned Area Maior), very popular during the summer. The Mount Louro is one of the natural treasures of the Concello de Muros, a medieval town proud of the marks those times left on its streets. The old town has a typology of houses that transport the traveller directly to the past, to a time when fishermen’s boats docked almost at the foot of the houses, with ample pointed arches in which today, in many cases, it is possible to enjoy the famous local seafood gastronomy.